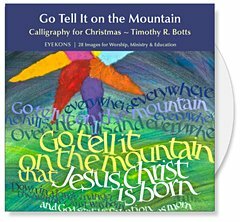 Calligrapher Timothy R. Botts offers his favorite Advent & Christmas scripture passages on a CD for churches. The Bible verses are painted in his imaginative calligraphic style and provide inspiring images that celebrate Advent and the Christmas season. Biblical art for visual ministry!